Copyright (C) 2008 OSP (Ludivine Loiseau). Copyright (URW)++, Copyright 1999 by (URW)++ Design & Development; Cyrillic glyphs added by Valek Filippov (C) 2001-2005 Cyrillic glyphs added by Valek Filippov (C) 2001-2005. This Font Software is an open font and is released under the GPL v2 with font exception; you can redistribute it and/or modify it under the terms of the GNU General Public License as published by the Free Software Foundation. This Font Software is distributed in the hope that it will be useful, but WITHOUT ANY WARRANTY; without even the implied warranty of MERCHANTABILITY or FITNESS FOR A PARTICULAR PURPOSE. See the GNU General Public License for more details. 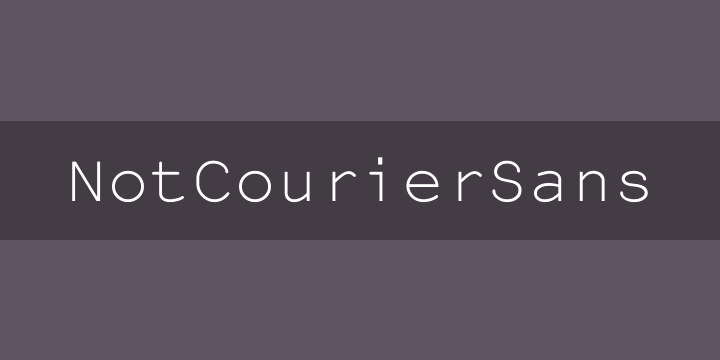 From the readme: NotCourier is a re-interpretation of Nimbus Mono and was designed in Wroclaw at the occasion of Libre Graphics Meeting (LGM 2008). We took Nimbus as the base of the design. We proceeded to remove the serifs with raw cuts. We did not soften the edges. We are not here to be polite.